I love art. I love doing it, I love seeing it, and I love thinking about it. And, that’s how this monochromatic collage project came about. It all started when I was browsing Pinterest and stumbled across this blog post for cardboard self-portraits. My mind started thinking two things: first, what an amazing project it was, and second, what else could we do with a similar method. After mulling it over in my head a few days, I latched on to the idea of a monochromatic collage. 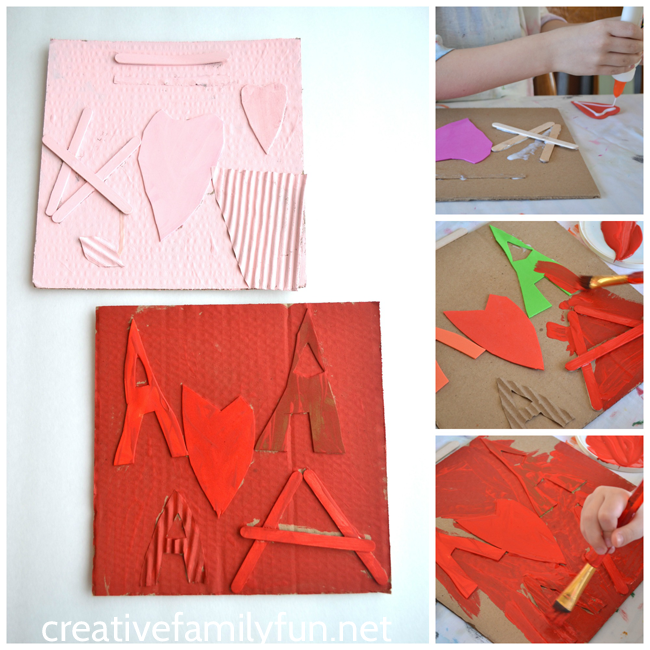 So, the other day after school, my girls came home to a table full of supplies and we had some fun creating a Monochromatic Collage Valentine’s Day Art Project. I looked through my craft supplies and pulled a variety of things that would provide texture and also would be able to be painted. I found squares of heavy cardboard (cut from a packing box) to use for our canvas. And, I tore out the middle of corrugated cardboard, so we could use the rippled part. I also found craft sticks and a pile of craft foam that hadn’t seen the light of day in a good long while. 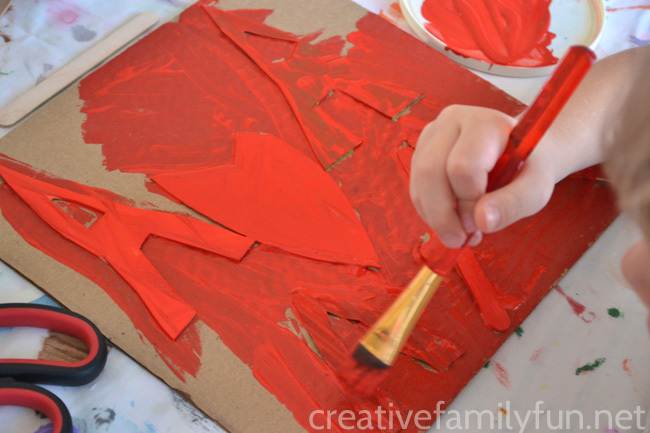 I grabbed glue, scissors, paint brushes, and pink and red paint, and spread them out on the table. Now all that I needed were the artists. I explained the concept: create a collage on your cardboard using the items I had out. 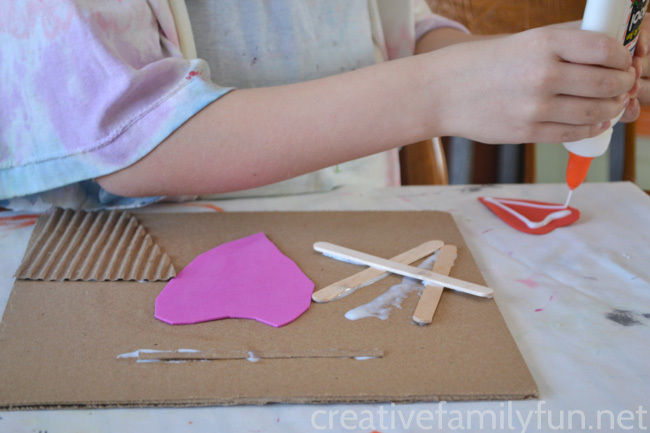 Once the glue dries, paint over the whole thing with your choice of paint color. I had one daughter come up with a deliberate plan, the A’s, and set out to create it. The other had a more organic process and just made it up as she went along. Once the glue was dry enough to not smear all over our collages when we painted, the girls painted over their project with a single color. This was such a fun and open-ended art project. Don’t limit yourself to the supplies I listed, just grab what you have at home. 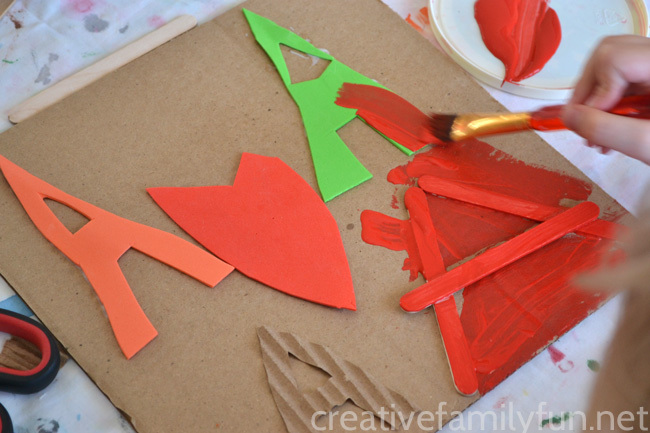 You only need to think about whether or not you can paint over the supplies you use. That’s it! 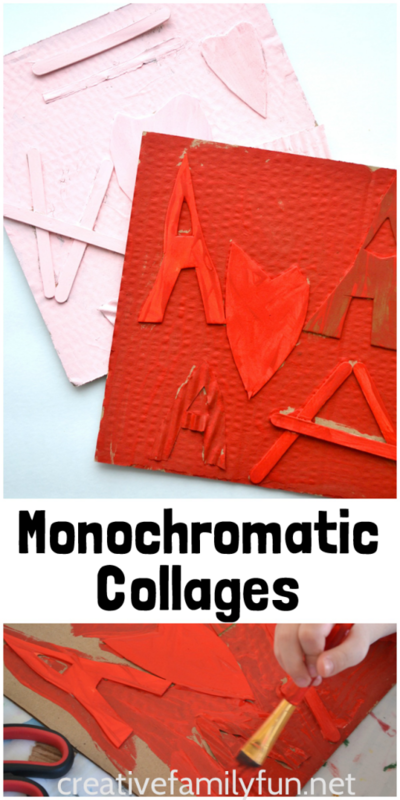 It’s time to go create a pretty Monochromatic Collage Valentine’s Day art project.